Spike Lee is the honorary guest of Love & Anarchy! The honorary guest of this year’s edition of HIFF – Love & Anarchy is Mr. Spike Lee, a true trailblazer of American and more specifically African-American cinema and a long-time HIFF favourite! Other main guests include legendary German director Margarethe von Trotta, Australian cult filmmaker Stephan Elliott, German-French-Iranian director Emily Atef and American actor and artist Shia LaBeouf. The Nordic Flair Award is given to Finnish actress Laura Birn. Spike Lee will be present at the screenings of his 1989 Love & Anarchy hit DO THE RIGHT THING and his latest film BLACKKKLANSMAN, which won the Grand Prix at the Cannes Film Festival in May. BlacKkKlansman is one of the summer’s biggest box office hits in Finland, partly thanks to actor Jasper Pääkkönen, who plays one of the main characters in the film. Lee’s visit culminates on the SPIKE LEE MASTERCLASS held at Korjaamo Kino Bio Rex on Saturday, September 22. Lee’s visit is organised in collaboration with the U.S. Embassy in Finland and Jasper Pääkkönen. Spike Lee’s films, typically referred to as “Spike Lee Joints,” have broken records and glass ceilings for black filmmakers over a span of four decades. Lee’s debut feature She’s Gotta Have It (1986) about a young Brooklynite juggling three suitors was an unexpected indie hit, and in turn created opportunities for a whole new generation of filmmakers. Lee has also directed such masterpieces as Malcolm X (1992), 25th Hour (2002), and Inside Man (2006). In 2015, the director was given the Academy Honorary Award for his contributions to filmmaking. ”Spike mentioned at the Cannes Film Festival that he wants to visit Finland at some point. Coming from his mouth instead of mine, it was obvious that he was serious about it. It’s awesome that he’ll be visiting Finland during Love & Anarchy”, Jasper Pääkkönen says. We are super excited to welcome you to Helsinki, Spike! Australian director and screenwriter Stephan Elliott experienced a worldwide hit with his second comedy THE ADVENTURES OF PRISCILLA, QUEEN OF THE DESERT (1994). The film’s positive representation of gender and sexual minorities ushered LGBTQ+ themes into mainstream cinema when two drag queens and a transgender woman embarked on a scorching bus ride through the Aussie desert. The film won the Audience Award at the Cannes Film Festival and an Oscar for Best Costume Design. In addition to Priscilla, Elliott presents his new feature film SWINGING SAFARI, a comedic look at the lives of three eccentric families living in a small Australian village in the 1970s. The cast includes Guy Pearce and Kylie Minogue. Margarethe von Trotta is one of the foremost directors of New German Cinema alongside Werner Herzog, Volker Schlöndorff and Wim Wenders. HIFF presents her new documentary SEARCHING FOR INGMAR BERGMAN, which examines the Swedish director’s influence on later filmmakers. German-French-Iranian director Emily Atef brings her film 3 DAYS IN QUIBERON to HIFF. Set in a rehabilitation clinic in Brittany, the film is a recreation of legendary film actress Romy Schneider’s iconic interview. 3 Days in Quiberon took not only the Outstanding Feature Film prize, but most German Film Awards at the Lola-Gala in April. Atef grew up in Los Angeles and Paris, and is a graduate of the illustrious Deutsche Film- und Fernsehakademie in Berlin. R&A Shorts presents #TAKEMEANYWHERE, a film by performance art group LaBeouf, Rönkkö & Turner. The trio was founded in 2014 and has been dubbed by Dazed magazine as “a multi-platform meditation on celebrity and vulnerability.” The documentary project follows the three artists – who share their GPS coordinates with the Internet – as they hitch rides on a month-long journey across North America. Shia LaBeouf, Nastja Säde Rönkkö and Luke Turner will all attend the festival. Their visit is organised in collaboration with the Finnish Institute in London. Finnish actress Laura Birn is the recipient of this year’s Nordic Flair Award. The award is granted each year to a top Nordic talent who is helping to put Scandinavia front and centre on an international level. 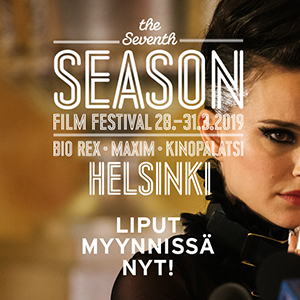 Birn is awarded for her inspiring and inspired work in a variety of roles she has played in both Finnish and international films and television series. A recent example is her role in the Netflix’s show The Innocents. The award is given by HIFF and its industry sidebar Finnish Film Affair. The whole festival programme will be published on this website on Friday, September 7 at 10am! The tabloid magazine presenting the programme will be available all over Helsinki from today onwards. You’ll be able to find it at cinemas, libraries, coffee shops and bars. Ticket sales kick off on September 13. Let’s festival! The submission for the National Competition of the Love & Anarchy Shorts is now open! HIFF reruns on sale now! Eleven days of cinematic heaven are here! HIFF Ticket Sales Begin With A Big Bang! Buy your festival voucher now! © Rakkautta & Anarkiaa 2019. All rights reserved.